The U.S. Environmental Protection Agency (EPA) has promulgated two regulations that require industrial sources to use particulate matter (PM) continuous emission monitoring systems (CEMS), and the EPA may require their use in other regulations1. Additionally, states may require them for state implementation plans (SIPs) and economic incentive program (EIP) monitoring. Also, industry may propose their use for Title V particulate emission monitoring. Choosing the correct type of PM CEMS for the specific application is one of the critical decisions that must be made for a successful PM CEMS program. Continuous monitoring of PM concentrations in smoke stacks started during the 1960s in Germany and became a German federal requirement in the mid 1970s. Today, PM CEMSs are in use in a variety of capacities around the world. In Germany, PM CEMS are used as compliance monitors of PM emissions from power plants and incinerators. 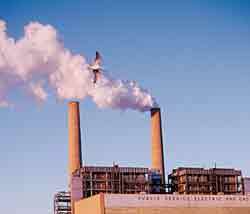 In Denmark, PM CEMS are used on power plant and sludge incinerator exhaust stacks. In Canada, PM CEMS are in use at many pulp and paper mills with some being used as environmental compliance assurance monitors in lieu of more frequent reference method (RM) testing for compliance. In the United Kingdom, PM CEMS are used at municipal and hazardous waste combustors, power plants and cement kilns in a compliance assurance manner. Also, in Korea, PM CEMS are used in a compliance assurance manner. In general, five analytical principles (light scattering, light extinction, optical scintillation, beta attenuation and probe electrification) are used in instruments to measure PM concentrations in exhaust gas streams. In general, five analytical principles (light scattering, light extinction, optical scintillation, beta attenuation and probe electrification) are used in instruments to measure PM concentrations in exhaust gas streams. A detailed discussion of these analytical principles can be found in the two referenced documents2,3. At least 25 instruments that use these principles are available as commercial production PM CEMS. Each of the five types of PM CEMS have advantages and disadvantages depending on the application. The selection of a PM CEMS should always be based first on the instrument's appropriateness to the source's exhaust gas conditions (e.g., moisture content, particle characteristics or velocity variability) and then other factors (e.g., cost, installation and maintenance requirements). The following sections describe the applicability of these instruments to specific exhaust gas conditions. Optical-based PM CEMS are those that use light scattering, light extinction (i.e., opacity monitors) and optical scintillation detection techniques. Optical-based PM CEMS report PM concentrations based on measurements of secondary properties of the light's interaction with the PM in the exhaust stream. The output of these instruments must be correlated to manual, gravimetric PM concentration measurements made with the particulate RM. The correlation relationship between the instrument's output and the RM particulate concentration is developed from at least 15 data points collected over the source's normal range of PM concentration. Light scattering and light extinction type PM CEMS have responses that are functions of the PM's index of refraction and size distribution. An optical scintillation type PM CEMS is similar to the light extinction instrument except that the scintillation instrument measures the modulation of the light frequency due to the movement of particles through the light beam and not the extinction of light. Since these techniques effectively measure particle volume, using optical based PM CEMS to infer PM concentration introduces an additional dependence on particle density. Also, these instruments will measure liquid droplets in the exhaust gas stream as PM. Light scattering based instruments have more design freedom than light extinction based monitors, because opacity monitors must conform to the design specifications of EPA's opacity monitor performance specification (PS) - 1. These design freedoms (e.g., light wavelength - red or near infrared (IR); scattering angle - forward, side, or backward; and solid angle of detection) can alter the response of the instrument. Changing the design of the instrument allows the manufacturer to minimize the influence of index of refraction and particle size distribution over specified size ranges. For example, instruments that use a light source in the red to near IR light spectrum are less sensitive to changes in particle size than instruments that use a green or white light source4. Since these instruments respond to liquid droplets in the sample gas stream, in-situ devices are inappropriate for saturated or nearly saturated exhaust streams. Extractive devices that heat the sample gas can be used on saturated or nearly saturated exhaust streams. Using these types of instruments on sample gas streams that are likely to have varying particle size distributions is less desirable, unless precautions are taken to avoid the effects of changing particle sizes (e.g., multiple correlation curves). Sources that combust multiple fuels, either simultaneously or independently, must seriously consider whether or not an optical-based PM CEMS is appropriate. These instruments are most appropriate for sources controlled by fabric filters (i.e., baghouse) or multi-stage air pollution control systems in which the particle size distribution at the outlet of the device does not vary much. Scintillation type PM CEMS are suspected to not respond to very small (less than two-micrometer effective diameter) particles. Beta attenuation (i.e., beta gauge) type PM CEMS are almost a direct measure of PM concentration in the sample gas. The output of this type of PM CEMS is a concentration value (i.e., milligram per standard cubic meter mg/scm) based on a measurement of PM mass and sample volume in each measurement cycle. Since the output is a concentration value that is based on the same principles as the RM, the manufacturers of these instruments insist that they do not need to be correlated to manual, gravimetric PM concentration measurements. With the exception of a weak dependence on particle composition, the beta gauge is immune to changes in PM characteristics. The main issues associated with the use a beta gauge PM CEMS are sampling related: maintaining isokinetic sampling and PM deposition in the sampling line. Two other important issues are: accurate measurement of the sample volume and stability and measurement of the beta radiation. Since beta gauge PM CEMSs are expensive ($50,000 to $70,000) and more bulky and difficult to install than optical instruments, they are expected to be used only in niche applications. In general, the beta gauge PM CEMS is applicable where the optical-based PM CEMS are not applicable. Since a beta gauge PM CEMS extracts and heats the sample gas, it is appropriate for sample gas streams that are saturated or nearly saturated. Since a beta gauge PM CEMS is much less sensitive to changes in particle size than optical-based instruments, it is more appropriate for sample gas streams that are likely to have varying particle size distributions (e.g., following an ESP or sources that use many different fuels). The response of a probe electrification type PM CEMS is based on measurements of secondary properties of the instrument's probe interacting with the particulate in the exhaust stream. The response is primarily a function of resistivity of the particles, with minor affects from flow velocity, particle size and particle charge. The output of this instrument must be correlated to manual, gravimetric PM concentration measurements. The selection of a PM CEMS should always be based first on the instrument's appropriateness to the source's exhaust gas conditions. Since probe electrification based PM CEMS are inexpensive ($5,000 to $10,000) and simple to install, they should also receive widespread consideration for use. Again, the user must be certain that the instrument is applicable to their source's PM characteristics. A probe electrification PM CEMS should only be used in exhaust streams that do not have varying particle sizes, do not have varying velocity, do not have saturated or near saturated conditions, and do not have varying particle charge. Probe electrification PM CEMS that measure the AC portion of the current are not as sensitive to gas velocity changes as DC measuring devices. These instruments are most appropriate for sources controlled by fabric filters (i.e., baghouse) or multi-stage air pollution control systems. The cost to purchase a PM CEMS can vary from $5,000 to $70,000, and the installation effort can vary from simple to quite complicated. Also, the maintenance effort can vary across a wide range. However, these points should not be the critical factors used to select a PM CEMS. The most critical factor to consider is the applicability of the instrument to the source's gas stream characteristics. A PM CEMS applicability is a function of the analytical technique employed by the instrument to detect PM. Table 1 provides a comparison of the PM CEMS's applicability. If the wrong instrument is selected, it will never correlate to the manual, gravimetric RM with the level of accuracy required. 1 Hazardous Waste Combustion Maximum Achievable Control Technology (MACT) standard (61 FR 17358, April 19, 1996) and Portland Cement Manufacturing MACT Final Rule (64 FR 31898, June 14, 1999). 2 Peeler, J.W. and Jahnke, J.A., Handbook: Continuous Emission Monitoring Systems for Non-criteria Pollutants, EPA 625/R-97/001, April 1997. 3 Current Knowledge of Particulate Matter (PM) Continuous Emission Monitoring, EPA 454/R-00-039, September 2000. 4 Uthe, E.E., Evaluation of an Infrared Transmissometer for Monitoring Particulate Mass Concentrations of Emissions from Stationary Sources, J. Air Poll. Control Assoc. Vol. 30, pp. 382-386, 1980. This article appeared in the February 2001 issue of Environmental Protection, Vol. 12, No. 2, on page 38.